Posted on Wed, Mar 13, 2013 : 4:17 p.m. The Fab Faux play at the Michigan Theater in 2012. The Fab Faux, the band that lovingly re-creates the sound of the Beatles—including their complex later music—live on stage will return to the Michigan Theater this spring. Following well-received dates in 2011 to play the Beatles' "Abbey Road" album in its entirety and last year to play "Sgt. Pepper," this time around the band will play all the songs from the double album "The Beatles," better known as "The White Album." The concert is set for 8 p.m. April 13. Tickets, at $29.50-$85, plus service charges, are on sale now via Ticketmaster.com and all Ticketmaster outlets, or by phone at 800-745-3000. From the announcement: "As the local crowds who have seen them perform Abbey Road and Sgt. Pepper's Lonely Hearts Club Band will testify, The Fab Faux is no ordinary Beatles cover band - they ditch the costumes and focus on the complex albums that the Beatles never played live. Rolling Stone Senior Editor David Fricke says The Fab Faux "invigorate the artistry of even the Beatles' most intricate studio masterpieces with top chops and Beatlemaniac glee." 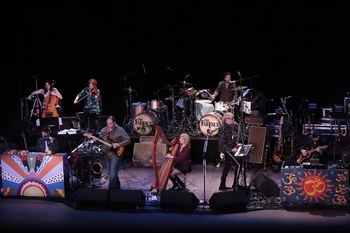 The group includes Will Lee (bassist in David Letterman's band), Jimmy Vivino (guitarist and music director of Conan O'Brien's band), drummer/producer Rich Pagano, guitarist Frank Agnello, and ace keyboardist Jack Petruzzelli - all outstanding New York studio musicians and lifelong Beatles fans. "To achieve all the dazzling effects included on The White Album, the concert will feature a horn section (Hogshead Horns) and string section (Creme Tangerine Strings). The Fab Faux will also welcome two new guests: Jim Boggia, a Royal Oak, MI, native, on guitar, bass, percussion, and background vocals, and writer-actor-musician Erin Hill on harp, percussion, and background vocals."